In today’s JuiceBox Owner’s Blog entry we’ll feature John from Florida. 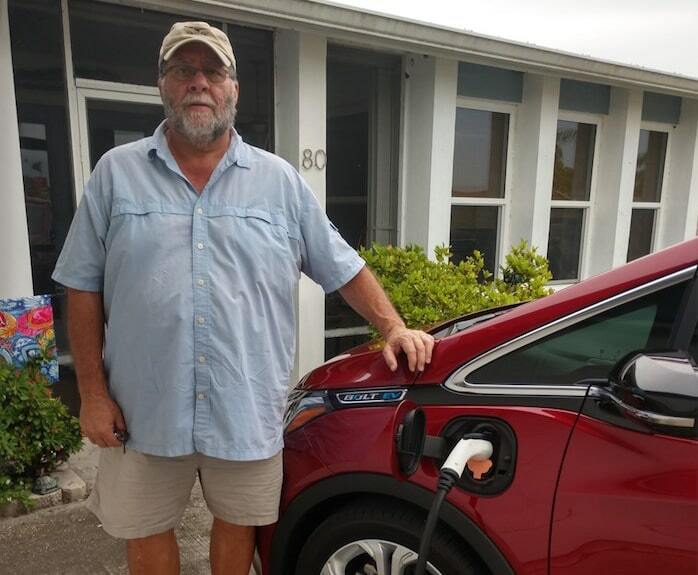 John’s a happy happy Chevy Bolt owner, and relatively new to electric cars. John realized that in order to get the most out of his Bolt, he needed to ditch the slow, level 1 EVSE that came with the car, and get a proper fast charger for his Bolt. After a proper due-diligence, John decided on the JuiceBox Pro 40 level 2 charging station. Has he been happy with it? We’ll let him tell you that in his own words below. Hello JuiceBox community! My name is John and I am a retired Utility supervisor from New York, now living in South West Florida. After purchasing a new 2017 Chevrolet Bolt on April 2nd, 2018 I realized I then needed to get a 240 volt, level 2 home charging station. Unfortunately, I didn’t know much about fast chargers for the Chevy Bolt, so I did some research and luckily found the JuiceBox Pro 40. It was highly rated, and seemed to have features that many other EVSEs didn’t offer. Additionally, the standard 24-foot cable (other companies charged extra for a 24-foot cable) and 40-amp capability were also strong selling points. "The JuiceBox can deliver up to 9.6kW, which is more than most other on Chevy Bolt charging stations available today." We plan to get another EV someday, and the longer cable will reach both cars in the driveway without needing to move them. Also, our next EV may be able to charge at a higher rate than the Bolt, and the JuiceBox can deliver up to 9.6kW, which is more than most other on Chevy Bolt charging stations available today. The faster charging can allow us to use the one charging station to charge two EVs, as it will charge them quicker than a lower-powered EVSE would. Being new to the EV world I was concerned about how much electricity the car would use. I really love the JuiceNet app because it allows me to see the exact amount of electricity I use for every charging session. I can then easily calculate how much the car costs to charge; without it I’d just really be guessing. I also like the fact that it plugs in, instead of needing to be hardwired. All I had to do was run a dedicated circuit with a NEMA 14-50 outlet and plug it in. The app was easy to install and pair with the station. As I mentioned above I did my research before buying the JuiceBox Pro 40 and I feel it’s reasonably priced for what you get. I’m very happy with my purchase; it does everything that I need it to, and I’m confident that I chose the right charging station for my Chevy Bolt.